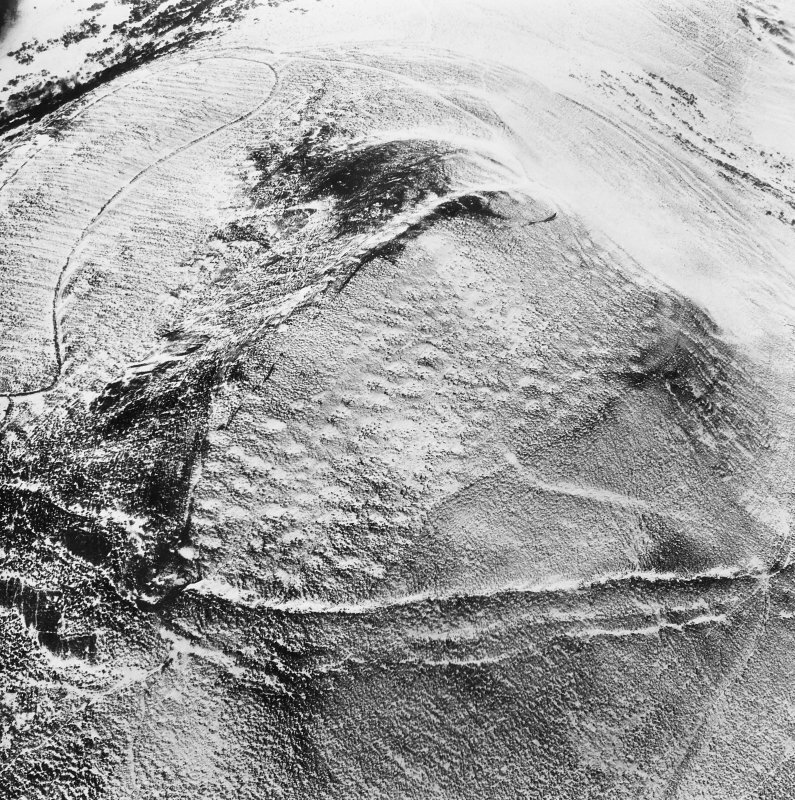 Oblique aerial view of the remains of the fort and plantation bank on Eildon Hill North, taken from the WSW. 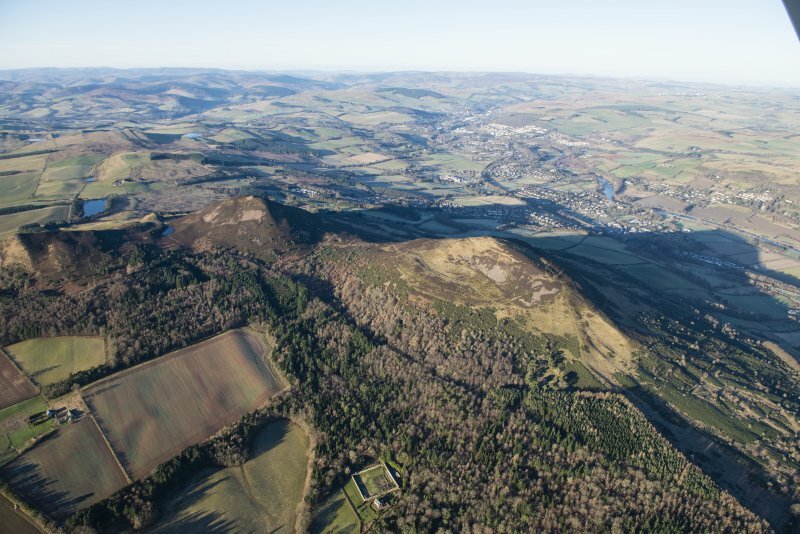 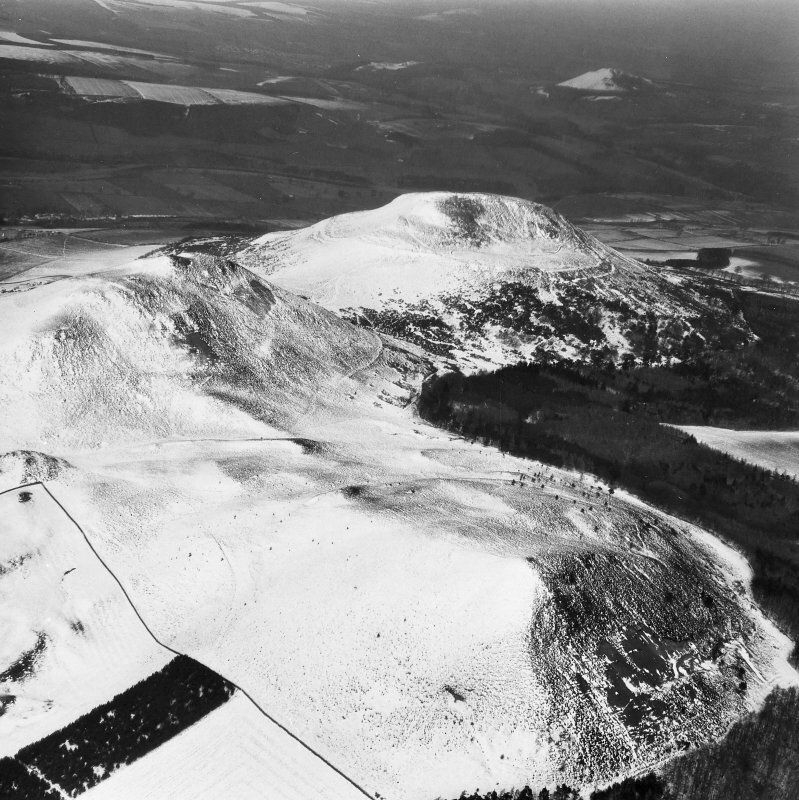 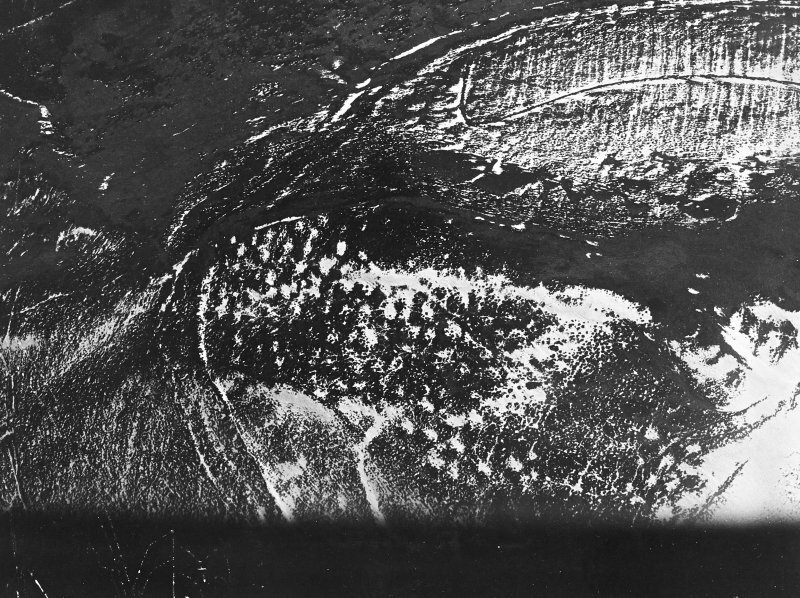 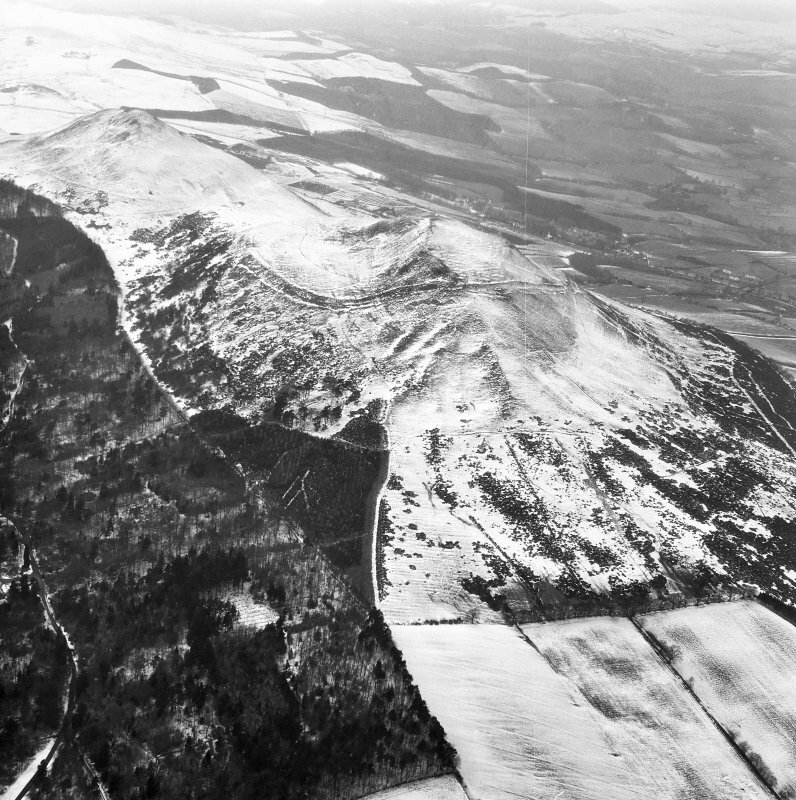 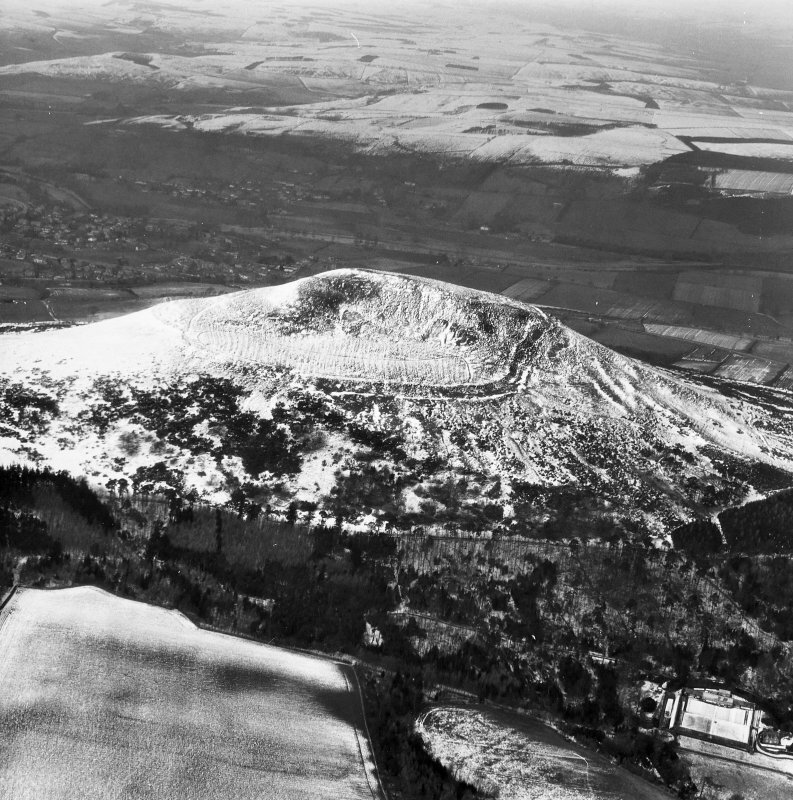 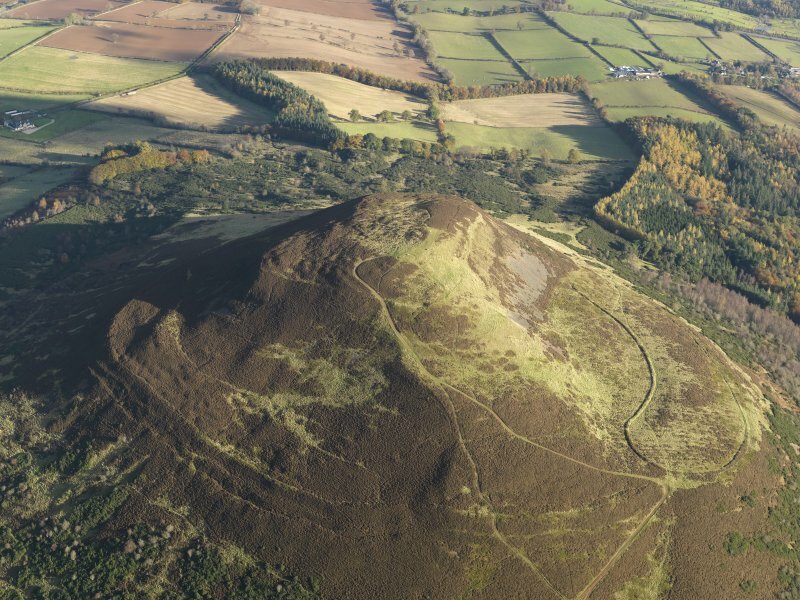 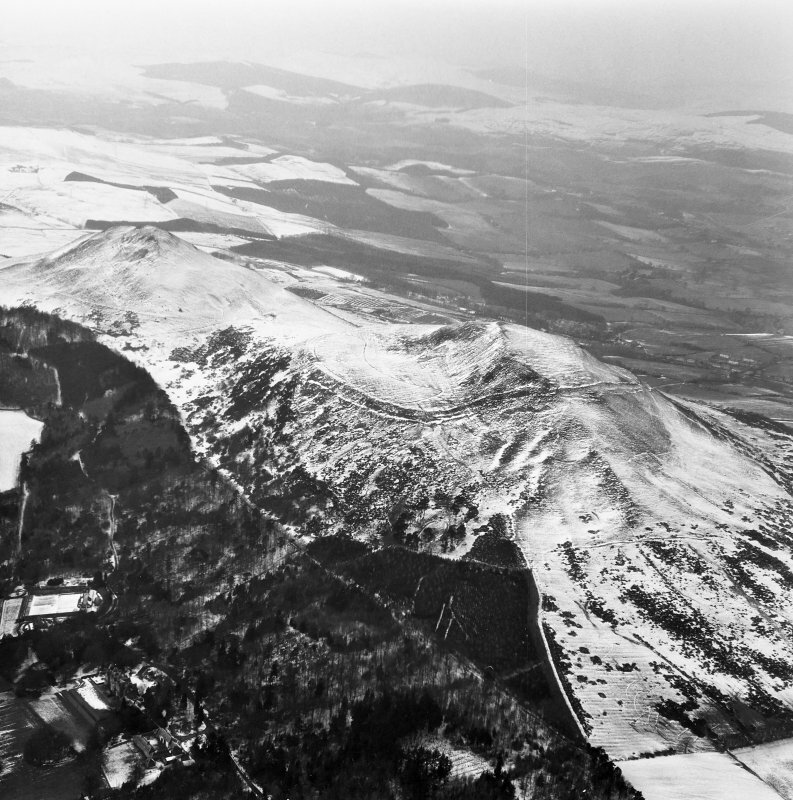 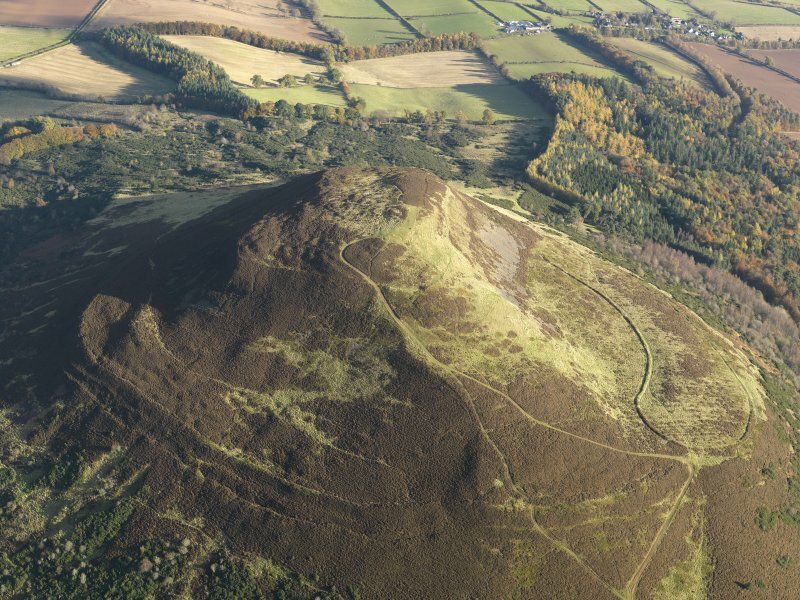 Oblique aerial view of the remains of the fort on Eildon Hill North, taken from the ENE. 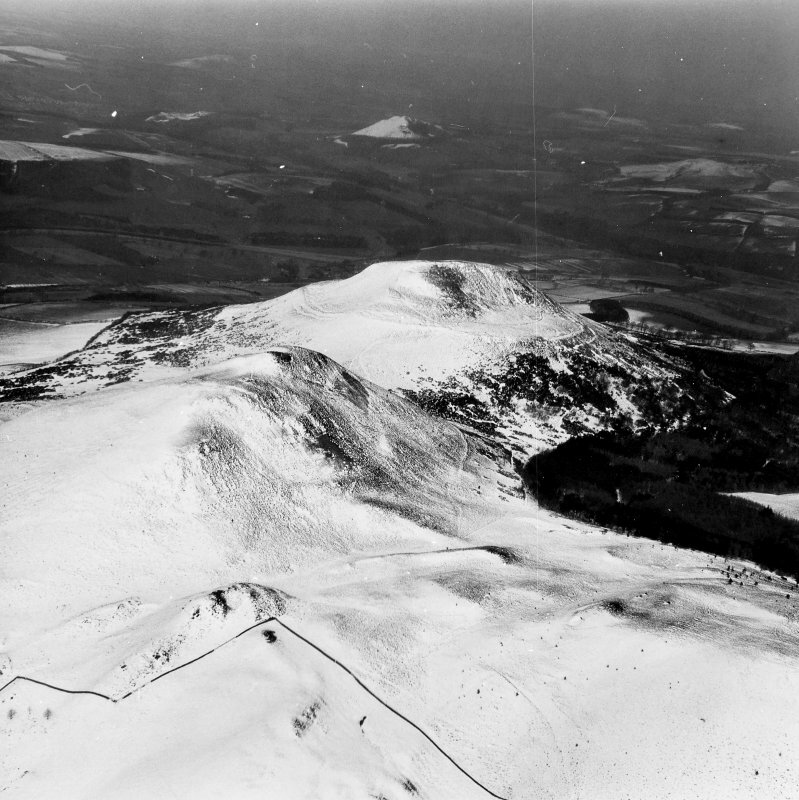 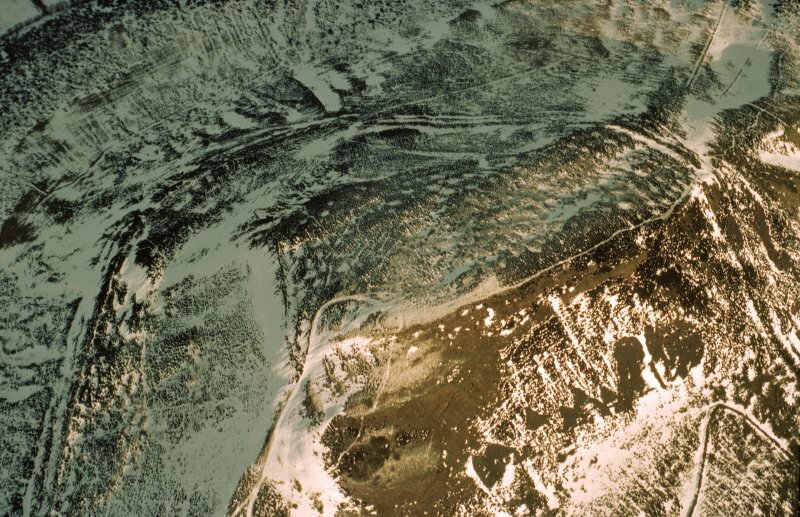 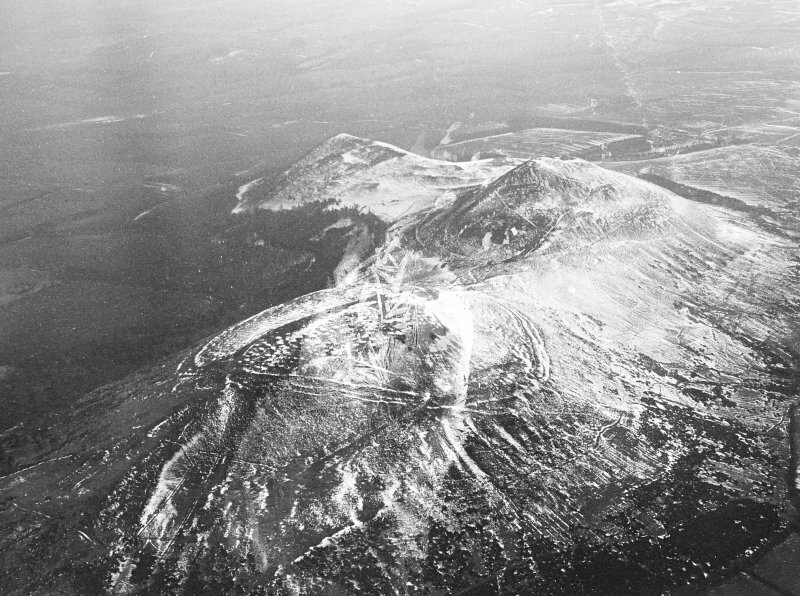 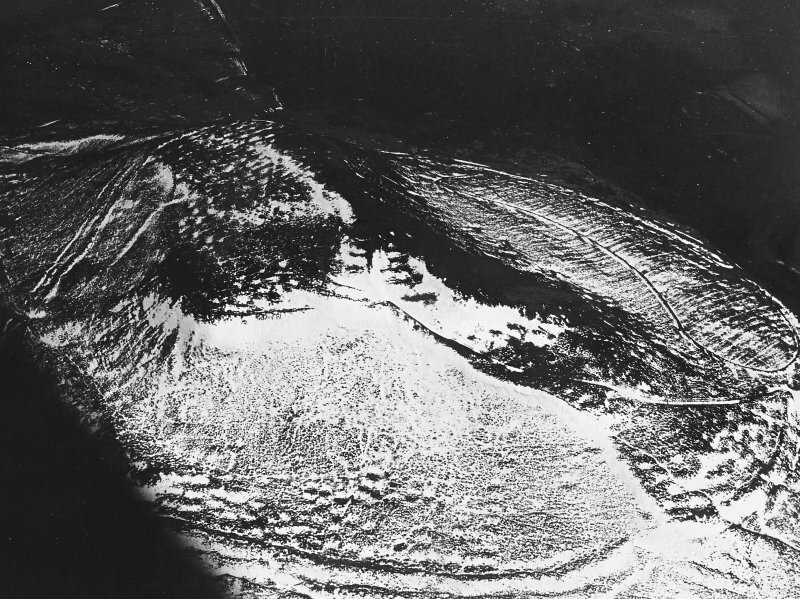 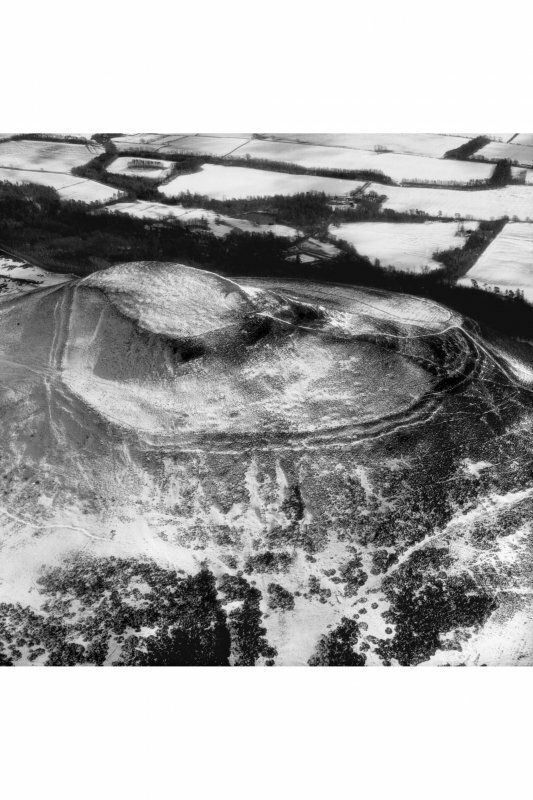 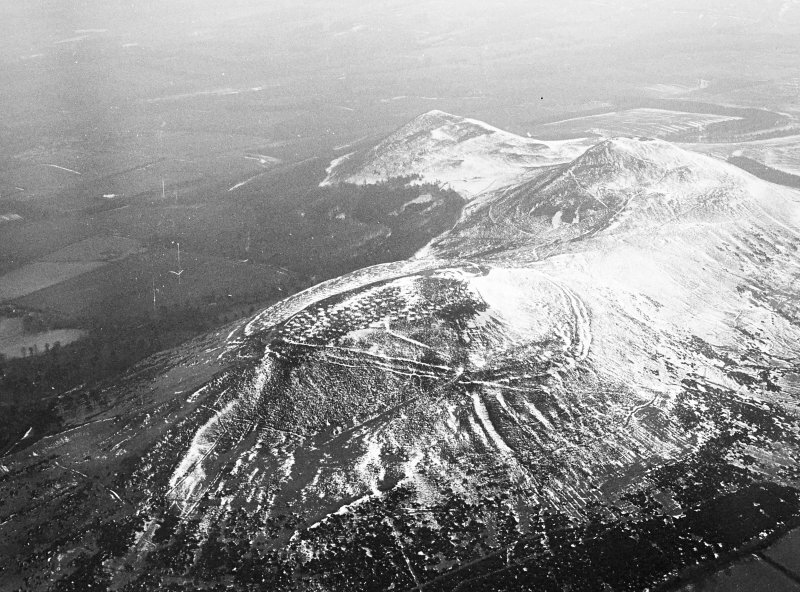 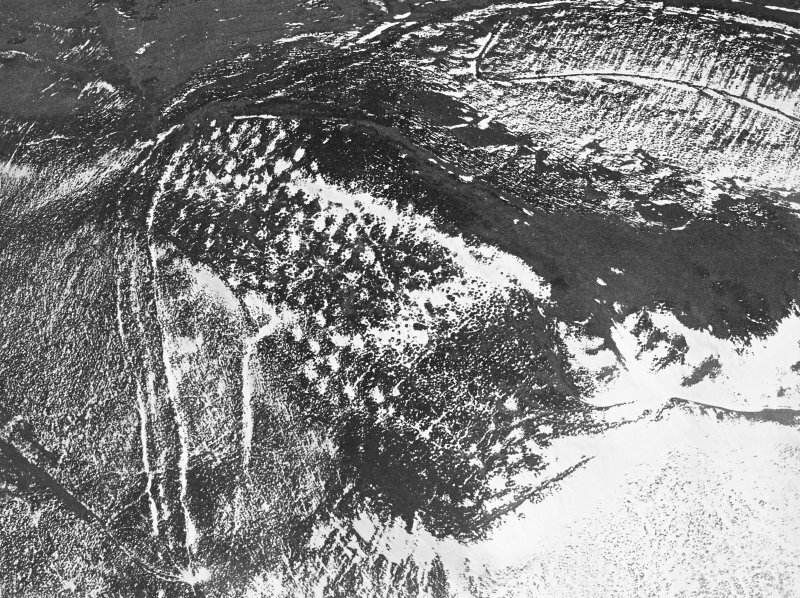 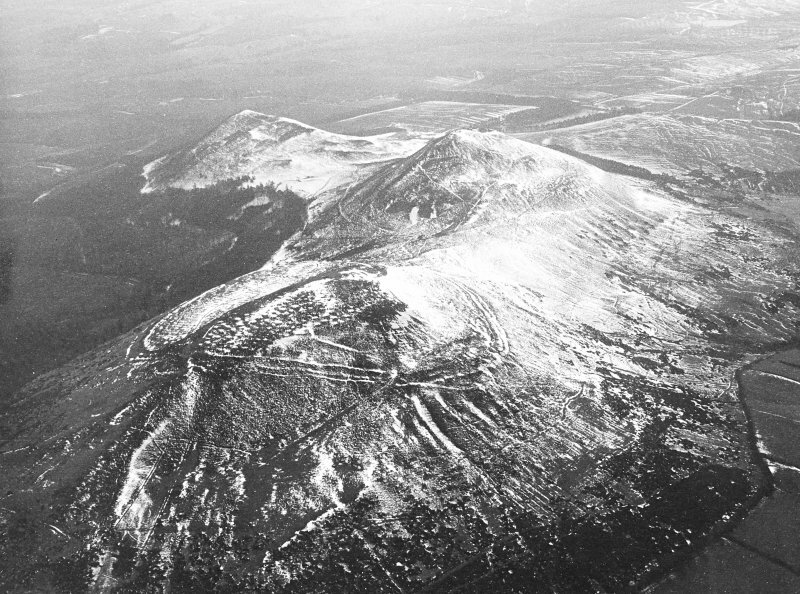 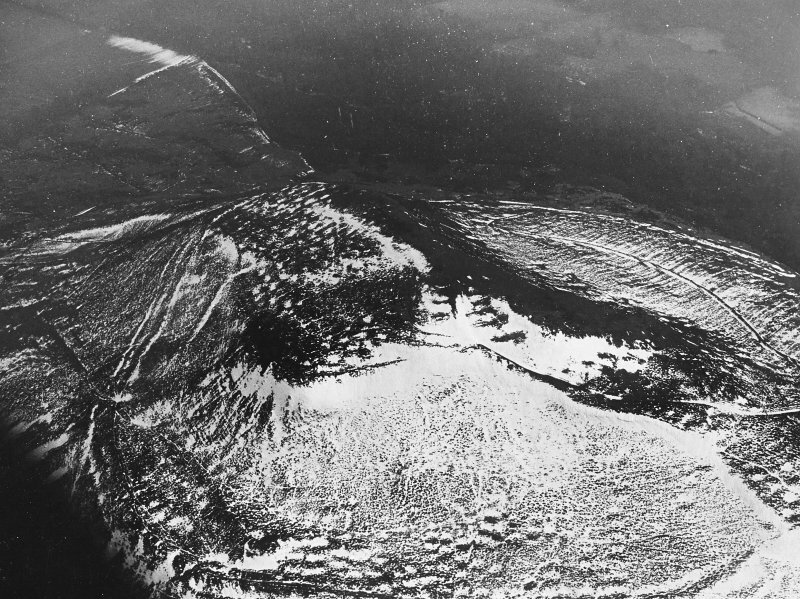 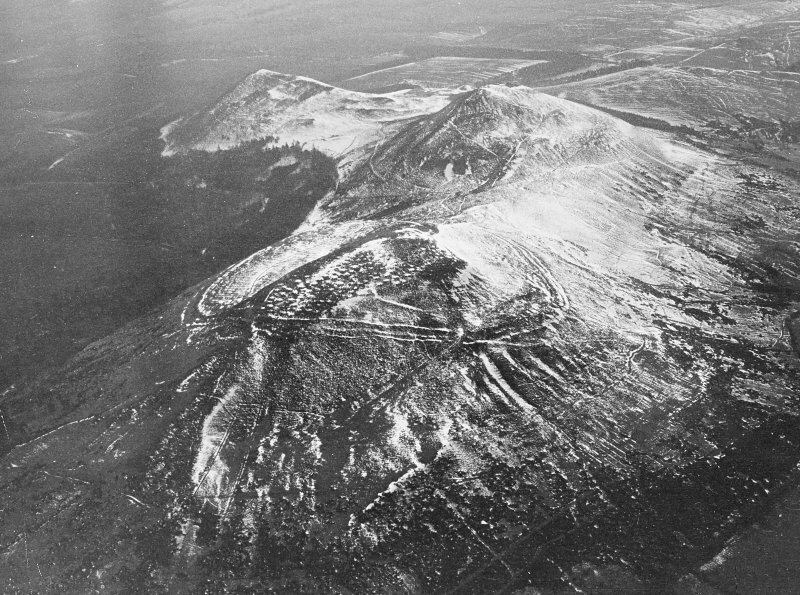 Scanned image of oblique aerial view. 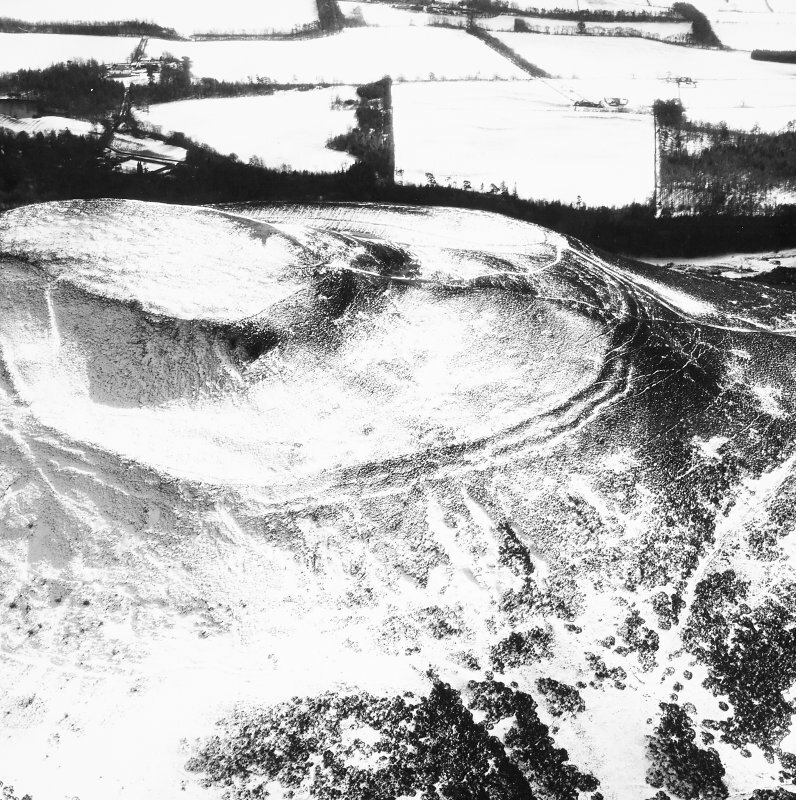 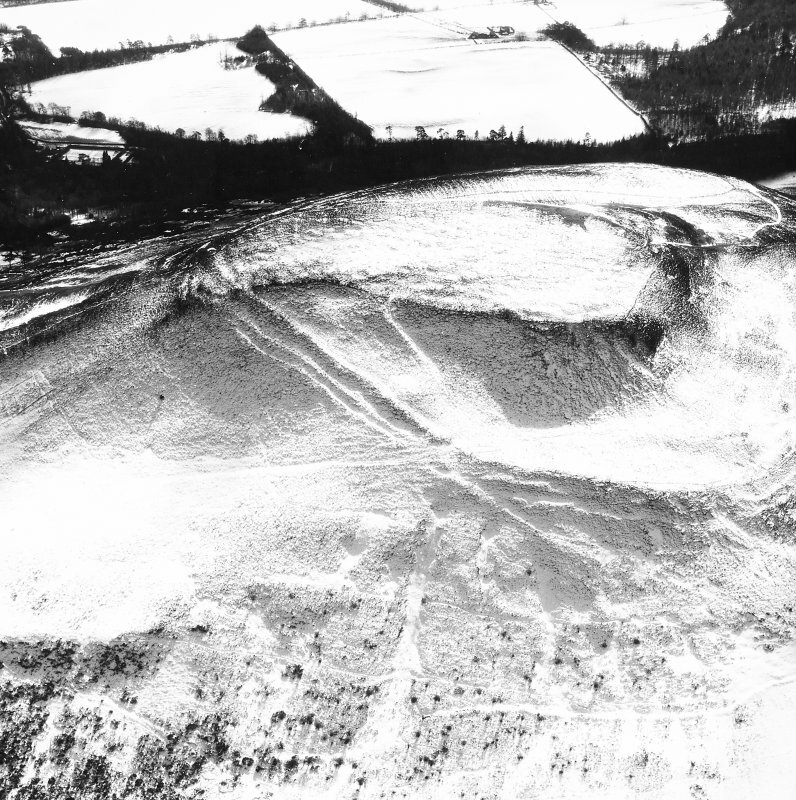 Oblique aerial view of the remains of the fort and plantation bank on Eildon Hill North, taken from the NE. 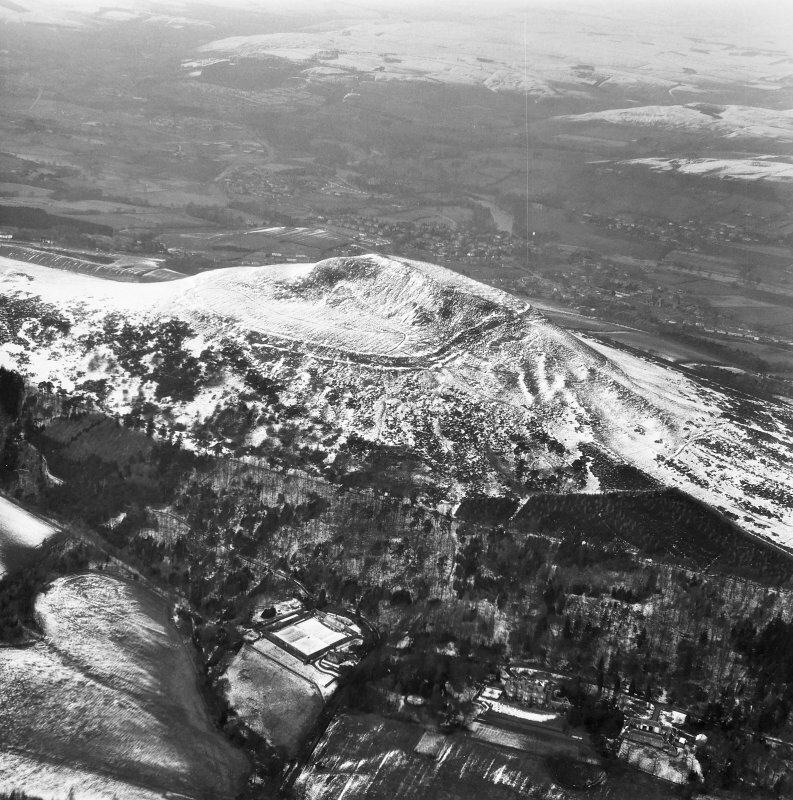 Oblique aerial view of the remains of the fort and plantation bank on Eildon Hill North, taken from the SW. 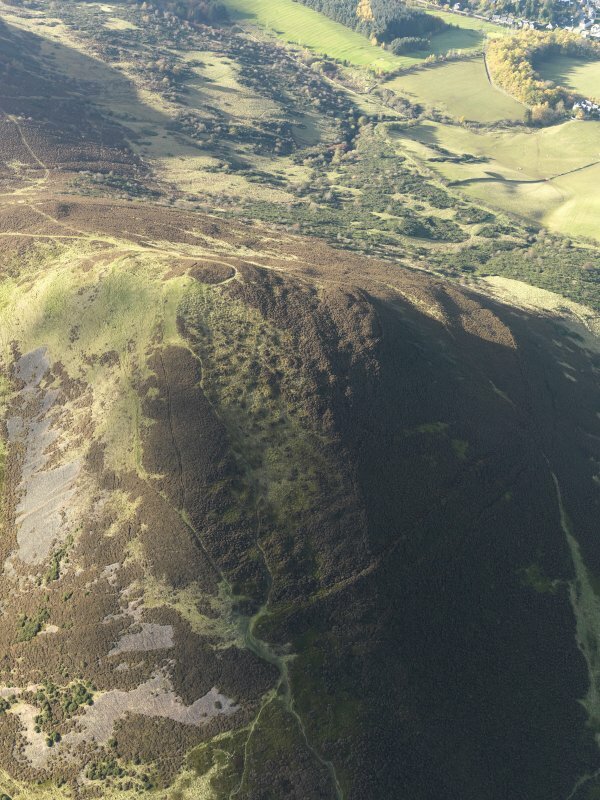 This Roman Signal Station is situated at the W end of the summit of Eildon Hill North (which is also occupied by the fort described on NT53SE 57). 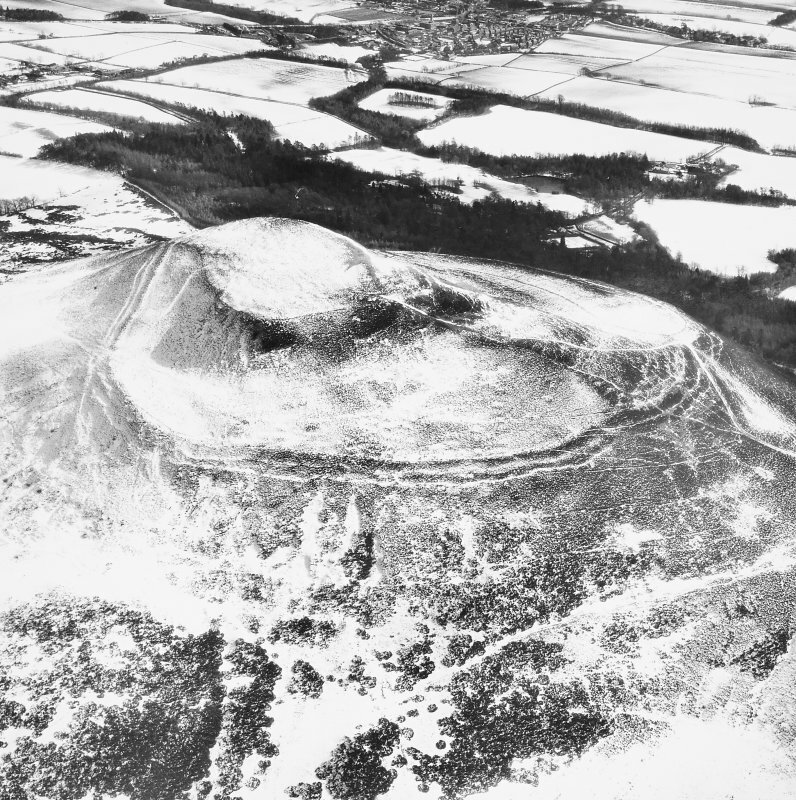 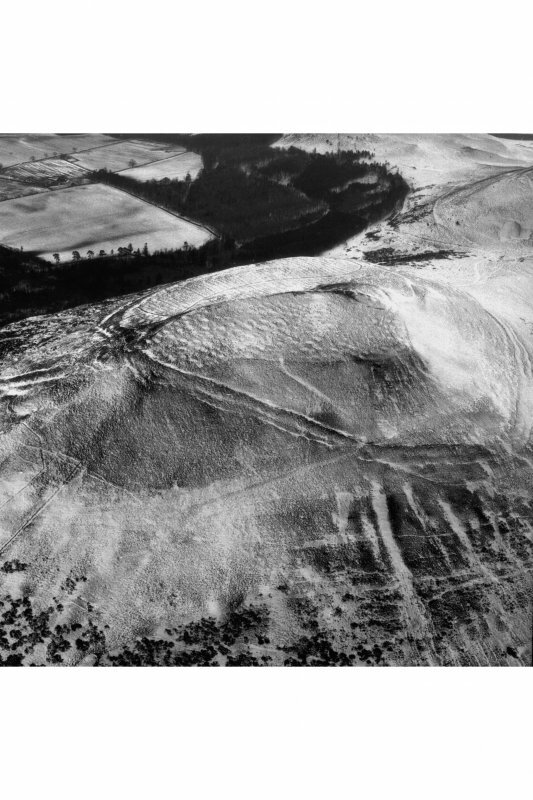 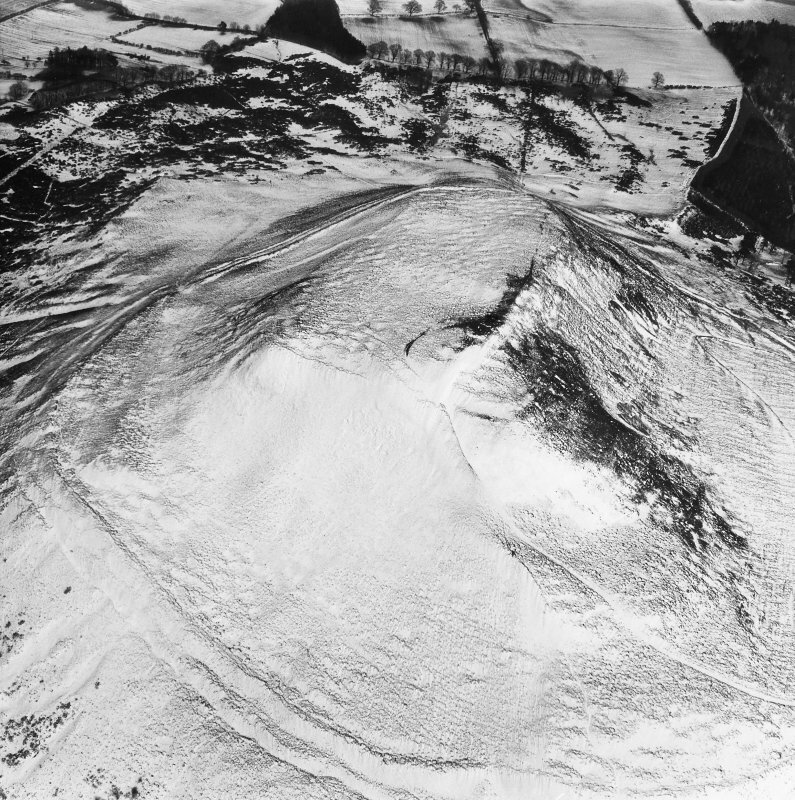 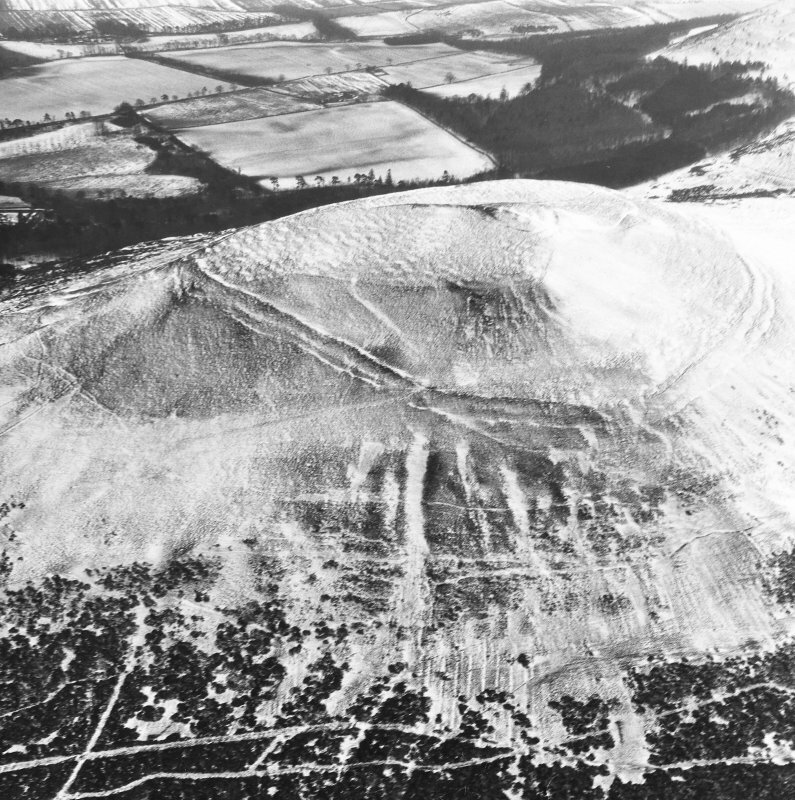 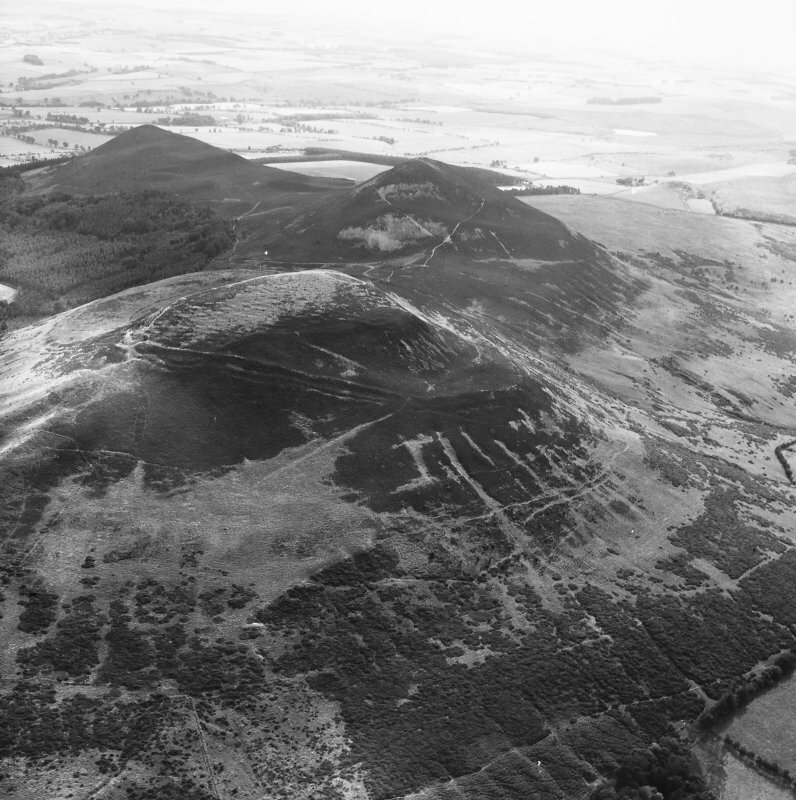 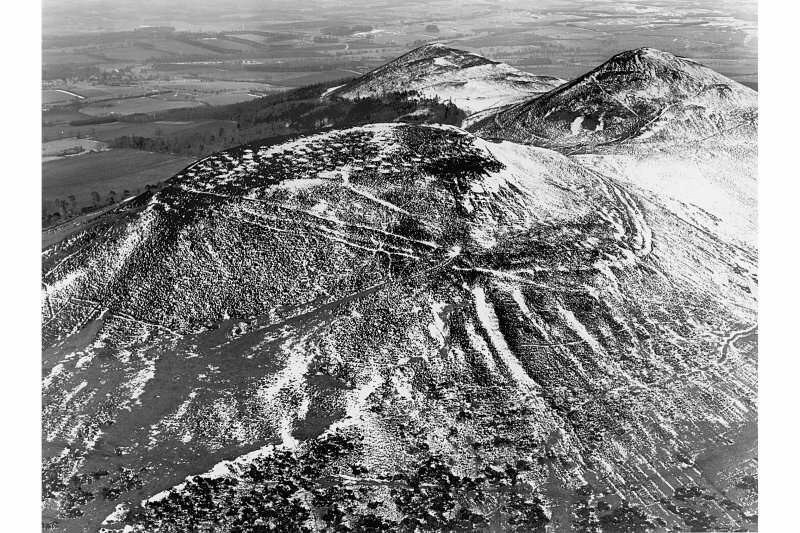 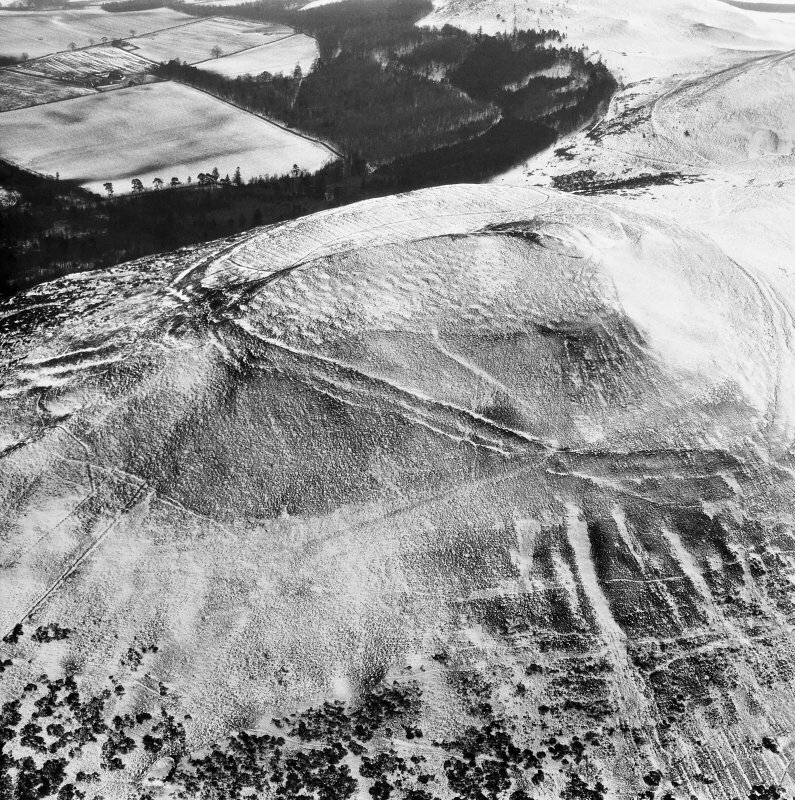 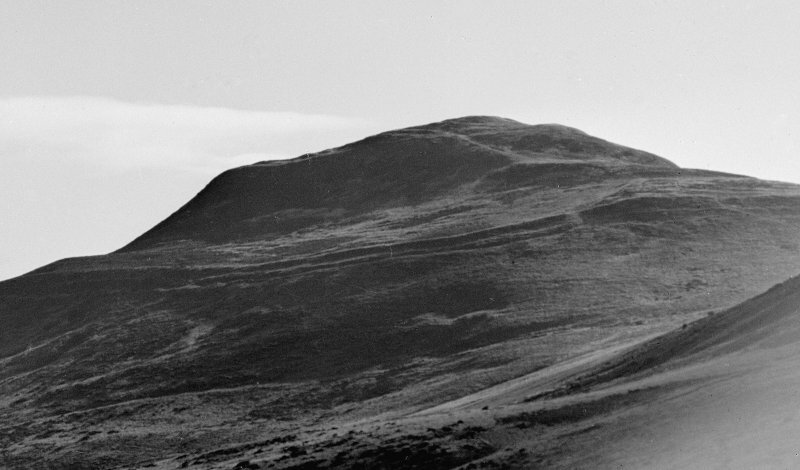 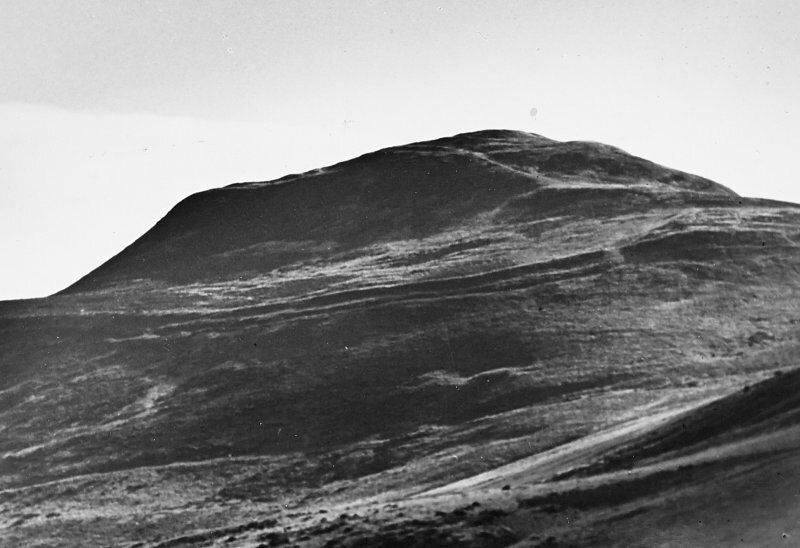 It appears as a circular ditched enclosure measuring 35 ft in diameter, which was partially excavated by the RCAHMS in 1952-3; they showed it to be a signal station similar to those found on the Gask ridge. 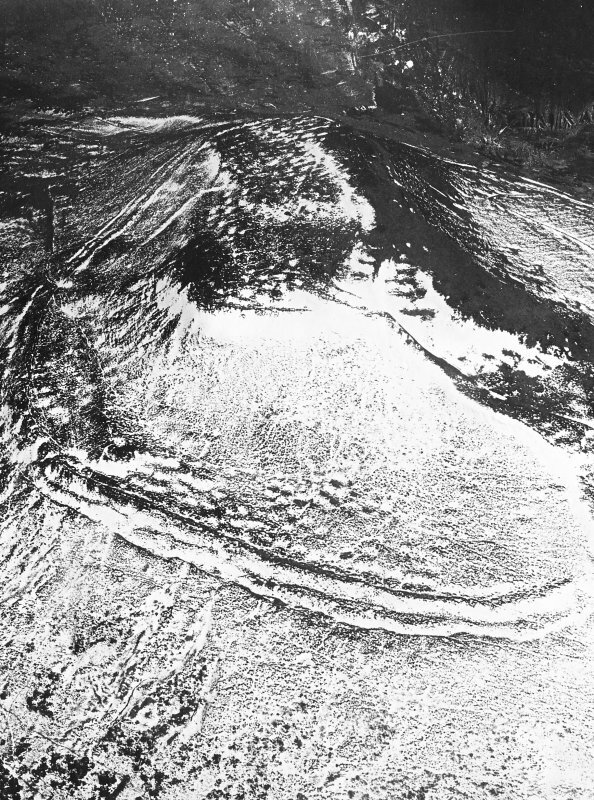 The ditch was merely a drainage trench, 7 ft wide and 10 ins to 16 ins deep, interrupted on the N side by a paved causeway 13 ft 6 ins wide. 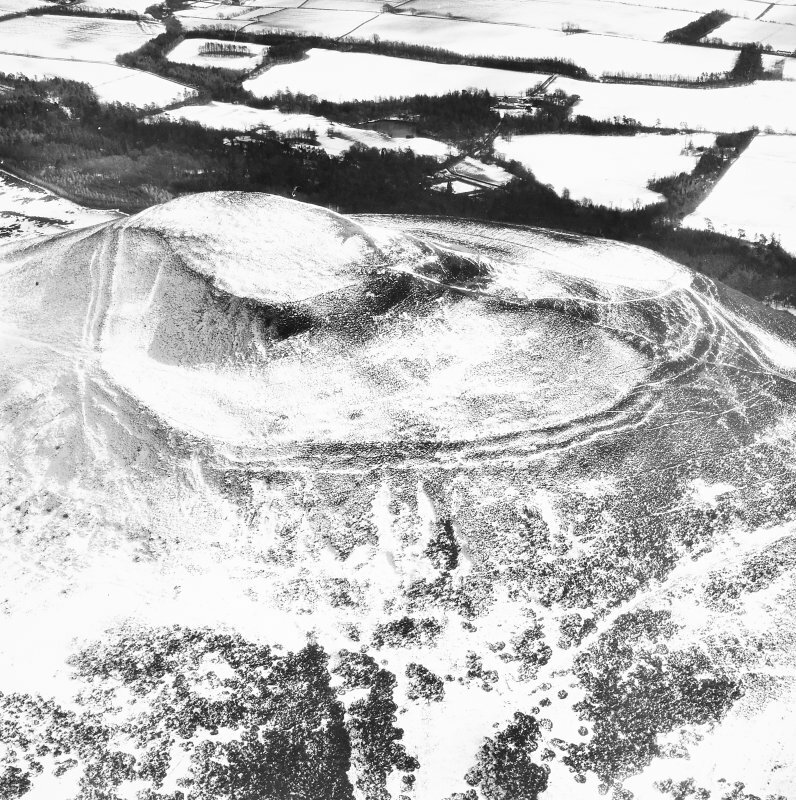 The interior of the enclosure had first been levelled, and then covered by a pitching of stones, 10 ins to 12 ins thick, which contained a scatter of animal bones from an earlier, native occupation-floor; several fragments of local Iron Age pottery, presumably from the same floor, were also found between the paving stones of the causeway. 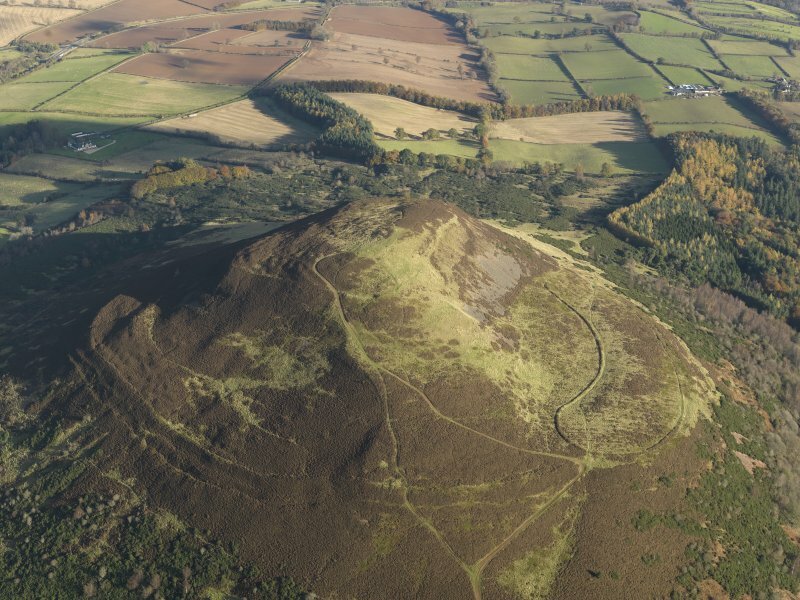 The signal tower, which stood in the centre of the enclosure, was a rectangular wooden structure, probably two storeys high, raised on a framework of six uprights and measuring 11 ft 4 ins in length by 10 ft 6 ins in breadth; the basement floor had been paved with stone and the roof tiled. 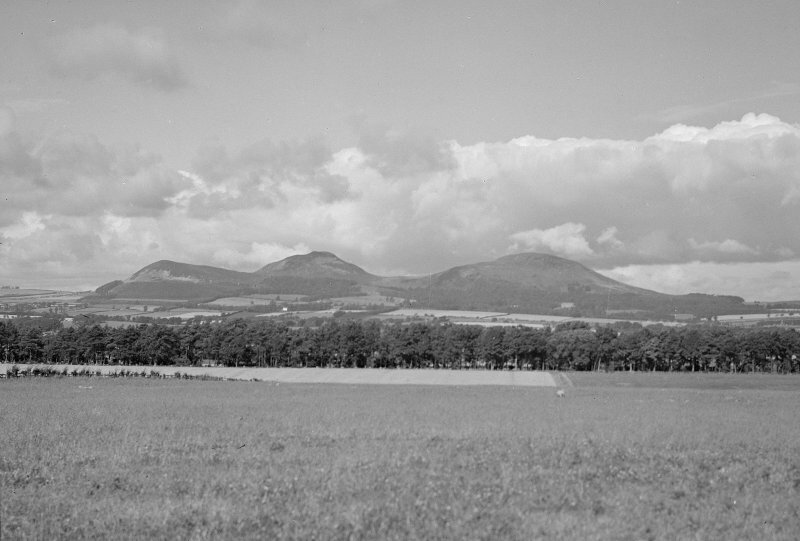 Although the only datable relic recovered was a dupondius of Trajan, minted in AD 116-7 (now in the National Museum of Antiquities of Scotland [NMAS]), structural analogies suggest that the tower was built in the Flavian rather than the Antonine period. 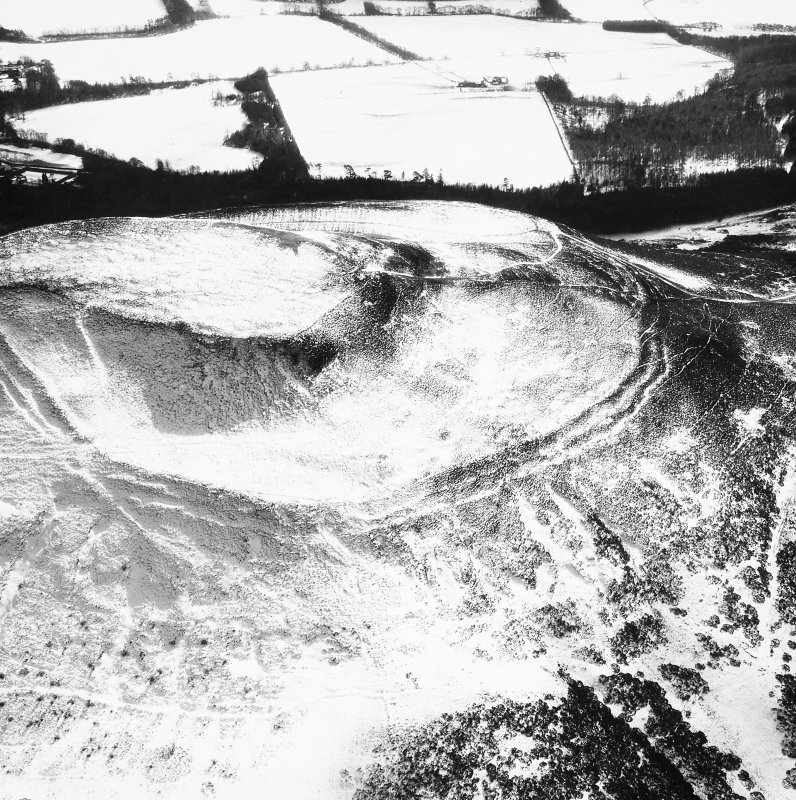 The Roman signal station is a circular platform, 15.4 m overall diameter and 0.1 m to 0.5 m in height, surrounded by a shallow ditch 1.7 m broad and 0.1 m deep, interrupted on the N by a causeway, 4.0 m wide. 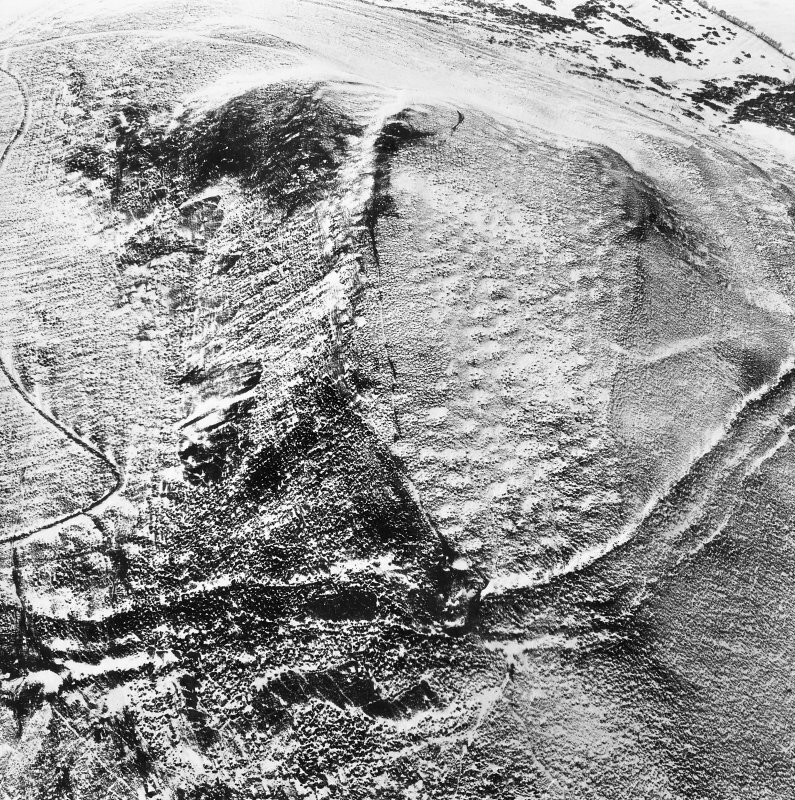 Though a Flavian date is surmised for this signal station, the discovery of tile, though possibly only indicating a tiled roof for the timber tower, also suggests that a second, stone-built, tower may have been erected nearby in the Antonine period. 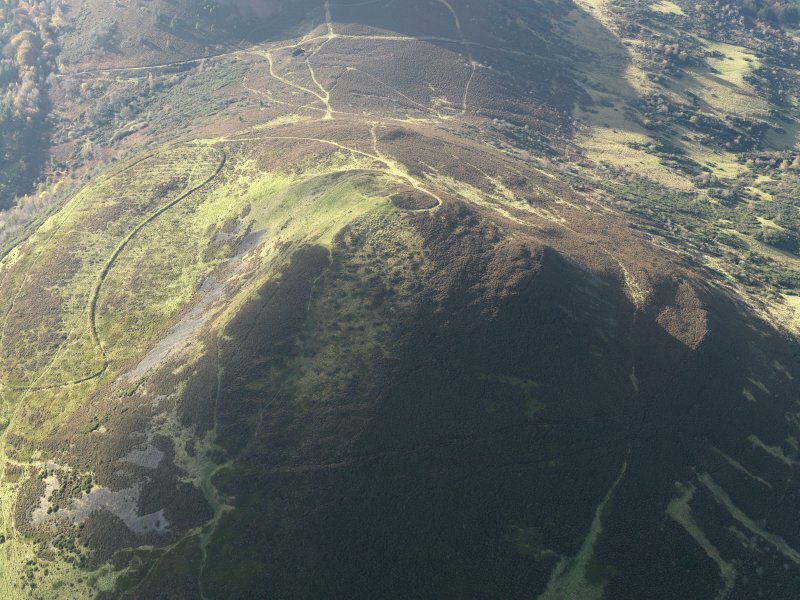 The purpose of the station was clearly to provide a telegraph for the Roman fort at Newstead (NT53SE 20) which is visible from it, and its height of 1,327 ft gives it a magnificent view. 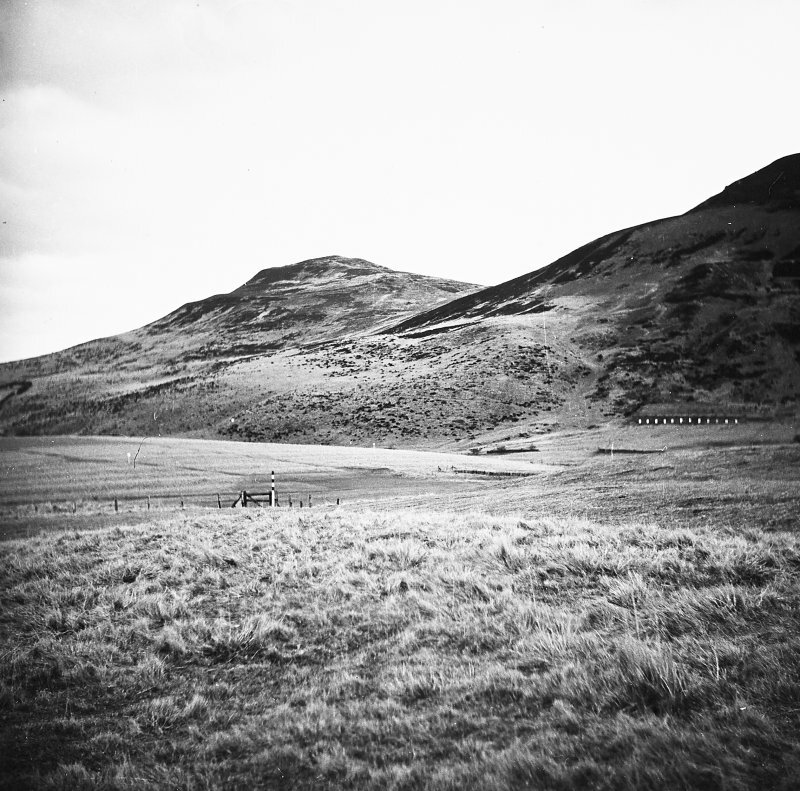 The same site has been used for beacons in more recent times.